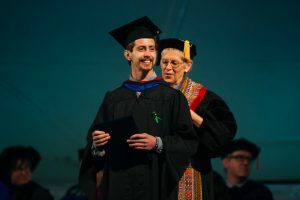 For the first time, graduates from Eastern Mennonite Seminary joined those of Eastern Mennonite University for the 100th Commencement ceremony on Sunday, May 6. 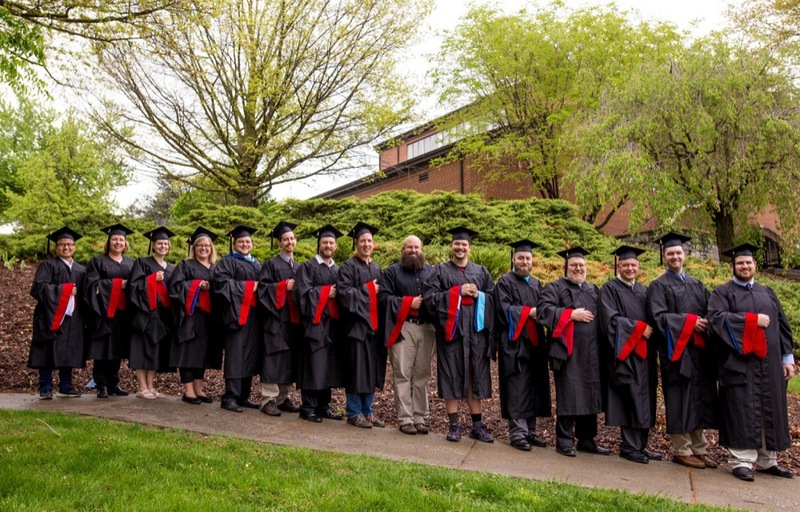 The seminary conferred 18 degrees and four graduate certificates. Among them were four graduates of the MA in Christian Leadership, a new degree program that balances spiritual growth, leadership training, and individualized integration of coursework that best fits the student’s intended ministry setting. The seminary baccalaureate and commissioning was Friday, May 4, in Martin Chapel. Seminary associate dean Nancy Heisey hoods a graduate Philip J. Yoder. In this place — Eastern Mennonite Seminary — are Biblical figures among a “great cloud of witnesses” and whose legacies live on, as does Jesus “in each face here,” the poem states. There are the Noahs “Gathering the beasts together / Building floating refugee boats for the coming flood,” the Leahs who are overlooked “but oh so strong / Steadily producing quality work / Steadfast and faithful,” the Marys “bearing the Spirit of God in their souls / boldly declaring with swelled bellies / that God is doing something new,” and many more. After missing out on the 2017 seminary baccalaureate because of illness, invited speaker Erin Dufault-Hunter, assistant professor of Christian ethics at Fuller Theological Seminary in Pasadena, Ca., returned to provide the keynote address. Dufault-Hunter is a longtime member of Pasadena Mennonite Church, where she regularly participates in the music team and occasionally preaches. Graduates Jason Wagner and Sarah Bailey provided reflections at the baccalaureate. Bailey was also among the students providing graduate perspectives at the main commencement ceremony on Sunday. Lorrie J. Aikens, Hot Springs, Va.
Sarah Christine Bailey, Elkton, Va.
Joshua E. Dalton, Altavista, Va.
Gabriel Phillip Dodd, Harrisonburg, Va.
Steven Ryan Giddens, Harrisonburg, Va.
Brandon Michael Hawley, Roanoke, Va.
Stephen Adam King, Broadway, Va.
Alexander James Mitchell, Gibsonton, Fla.
Matthew Alan Nyce, Broadway, Va.
Charles Raymond Tinsley III, Dinwiddie, Va.
Jason Allen Wagner, Harrisonburg, Va.
Philip Jason Yoder, Harrisonburg, Va. Dawn R. Reidy, Bunker Hill, W.Va.
Ken Ryan Wettig, Harrisonburg, Va.
There’s a lot of ‘Adams’ in this place. but ‘Adams’, with a ‘D’, like the building block of humanity. Look around! Do you see them? Can you see who God has made you to be? And can you see from where, from whom you come?